The first is to bathe in a tub filled with mixture of water and unsweetened cocoa. Sometimes this mixture is whipped with milk; sometimes sweetened chocolate is offered to the bathers to eat (or, as is the case at one spa in Japan, it is poured on their heads). The second option is to have a thick chocolate smear applied to you, either by a masseuse or in the form of a body wrap. The chocolate can be so enveloping with the second option that you may feel like you are in a bath even without the sensation of splashing around in liquid. 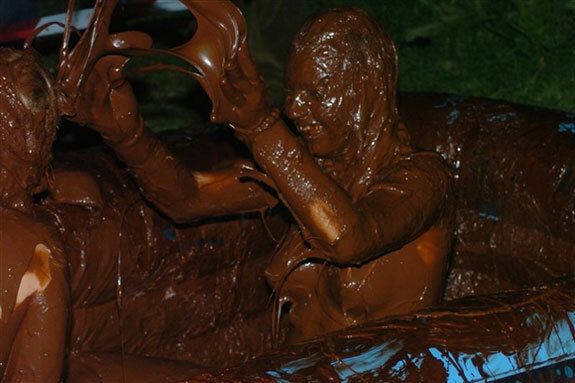 No matter what kind of chocolate bath you end up with, the cocoa is believed to be good for your skin. More importantly for the romantics in our audience, chocolate causes the body to release feel-good hormones similar to those released when you are in love. (Biologically speaking, those who claim chocolate equals love aren’t far off). I’m sold. Where can I go for such a bath? Geneva is one of the world’s premiere cities for chocolate. After The Rain is one of Geneva’s best spas. So it isn’t surprising that several chocolate-related treatments are on offer there. Of those, we’re partial to the Je T’aime Moi Non Plus package — it’s designed for two people and includes a 30-minute non-chocolate bath, a 45-minute cocoa bean oil massage and a 30-minute chocolate and whipped cream bath. Afterwards, guests are invited to drink green tea and enjoy chocolate in the more traditional way (eg. eating it). The whole package is CHF350 (around €280). Really can’t get enough of the sweet stuff? You’ll get no sweeter than the Caramels, Candy and Chocolates package for CHF600 (for two people). It includes a caramelized double exfoliation, a massage with cocoa bean oil, and a chocolate bath on a Chantilly cream cloud followed by a caramel, candy and chocolate chip feast. The Pennsylvania town named after the famous chocolate company founded there is also home to the world’s only chocolate-centric spa. 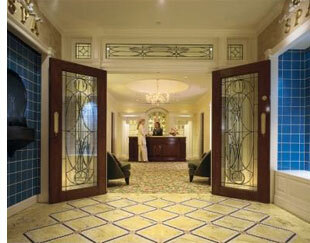 The logically-named Chocolate Spa is part of the equally logically named Hotel Hershey. The spa is a maze of 54 treatment rooms (dotted with large jars of Hershey Kisses). Inside those rooms you might find people receiving chocolate hypnotherapy treatments, chocolate sugar scrubs and chocolate bean polishes (ie. an exfoliation using cocoa bean husk). Of prime importance for this article, however, is the spa’s bath of whipped chocolate milk. Enjoy it while basking in the glow of Tootsie Roll-flavored candles and breathing in brownie-batter-scented steam. It’s a slice of chocolaty heaven. At $45 for 15 minutes, it’s also the most inexpensive chocolate bath we know of. Every year between February 14th (aka Valentine’s Day) and March 31st the Hakone Kowakien Yunessun outside of Tokyo hosts a chocolate bath. The romance of the experience is rather diminished by the large presence of grandparents and kids in the large communal pool. (If kids will happily pee while swimming in clear water we shudder to think what they’d do while bathing in warm chocolate). Still, the chocolate bath is well worth the experience, especially if you partake during a time when spa employees pour chocolate sauce all over the bathers. (That happens Monday through Friday at 11:30am, 2pm and 3:30pm; Saturday and Sunday at 11:30am, 2:30pm and 16:20pm). Not incidentally, Hakone Kowakien Yunessun is one of the most unusual . . . we’re not even sure what to call it. Imagine a mix between a spa, a water park and a party gone weird. Whatever that is, Hakone Kowakien Yunessun is the world’s most unusual. The Mori No Yu portion of the property is an adult-only nudist colony. The other half, the Yuneesun Resort, is for kids and contains all sorts of unusual baths. In addition to the chocolate bath, guests can soak in green tea, sake, coffee and wine! We’ll be reviewing Hakone Kowakien Yunessun in a future post. 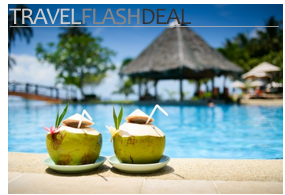 Sign up for our RSS or email service to get that, and all Spot Cool Stuff travel articles, delivered to you as they are published. Boating in a Hut Tub? This seems really cool. Actually, I have never tried chocolate spa. How does it feel by the way? Cool article, as a real chocolate lover myself, I’ve visited The Chocolate Spa in Hersey… Enjoyed a nice chocolate whirlpool followed by a nice chocolat massage! Chocolate. Spa. Bath. I like ALL those words. What a fun and creative way to enjoy the company of someone I love and my favorite food group. This site always has the best creative travel ideas. But really? 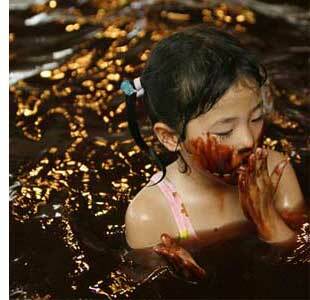 Taking a bath in chocolate? I think I’m with Mia on this one. Hm…i like chocolate but only when I eat it. It looks strange to me.